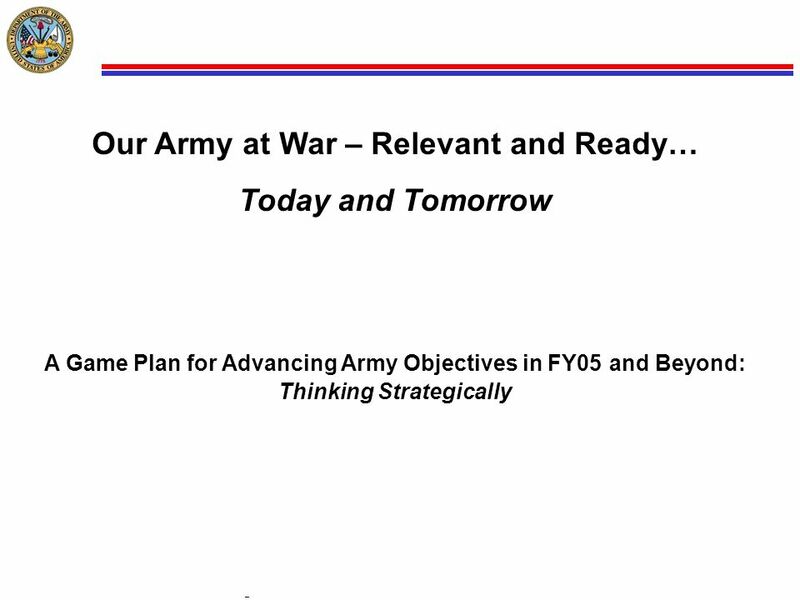 Today and Tomorrow A Game Plan for Advancing Army Objectives in FY05 and Beyond: Thinking Strategically The single most significant feature of our new strategic reality is that the war in which we are now engaged will be a protracted one. To fulfill our duty within this new strategic context, we are aggressively reshaping the force to be an Army of campaign quality with joint and expeditionary capabilities – transforming to enable us to win the war today, while simultaneously posturing the Army for future challenges. The lessons we have learned in three years of war have already propelled a wide series of changes in the Army and across the Joint Team. Our core competencies, however, will endure: to train and equip Soldiers and grow leaders and to provide relevant and ready landpower to Combatant Commanders and the Joint Team. Our circumstances today, as an Army serving our Nation at war, provide us with a strategic opportunity to reshape the force. Today I will discuss with you a plan intended to help focus the efforts of leaders – across the Army – to address a set of major issues the Army is facing so that the Army will remain relevant and ready by providing the Joint Force with essential capabilities to dominate across the full range of military operations. The Army has a great deal of requirements prescribed by National, Defense, Combatant Command, and Joint directives. We have clear strategic direction developed during the past year. A well articulated, well managed Army Campaign Plan. Numerous authoritative documents that communicate intent. Several key papers by leaders (e.g., Adapt or Die and Serving a Nation at War). We have several key documents in various stages of development: The Army Plan (i.e.., Section I -- Army Strategic Planning Guidance (ASPG)) Program Objective Memorandum 06-11 The FY 06 Legislative Agenda (DRAFT) Army Strategic Communications Plan (DRAFT) Mission: We have a mission of deadly importance … A unique opportunity to get it right … The Game Plan represents the integration of the work we have done in the last year – reflected in key documents that describe the Army’s strategic direction: The Transformation Roadmap, The Army Plan, the Army Campaign Plan, the Program Objective Memorandum 06-11, as well as several papers that communicate “big ideas” from the leadership. We have embarked on our most profound transformation since World War II – and are making tremendous progress. The authoritative direction for this change is communicated in the Army Campaign Plan (ACP). 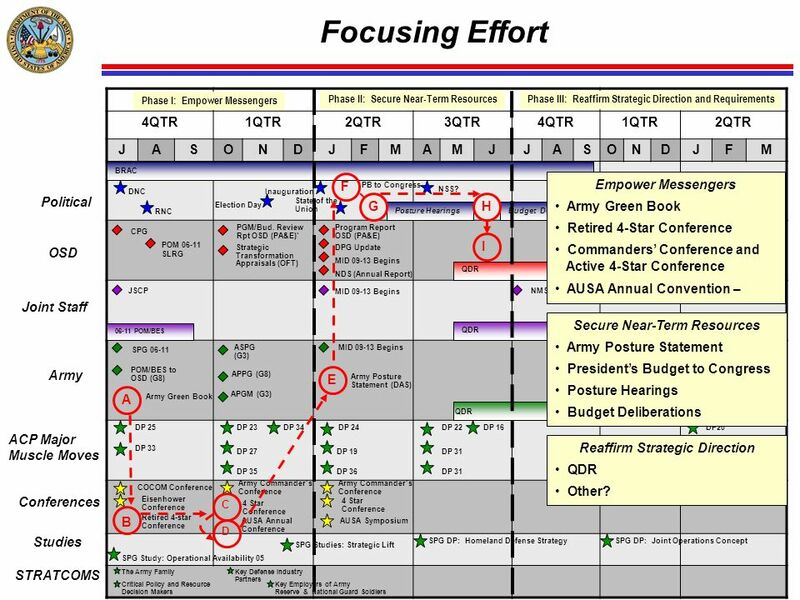 The Game Plan reinforces the ACP by articulating a set of distinct leader objectives – and corresponding priorities – to support the continued successful execution of the Campaign Plan. 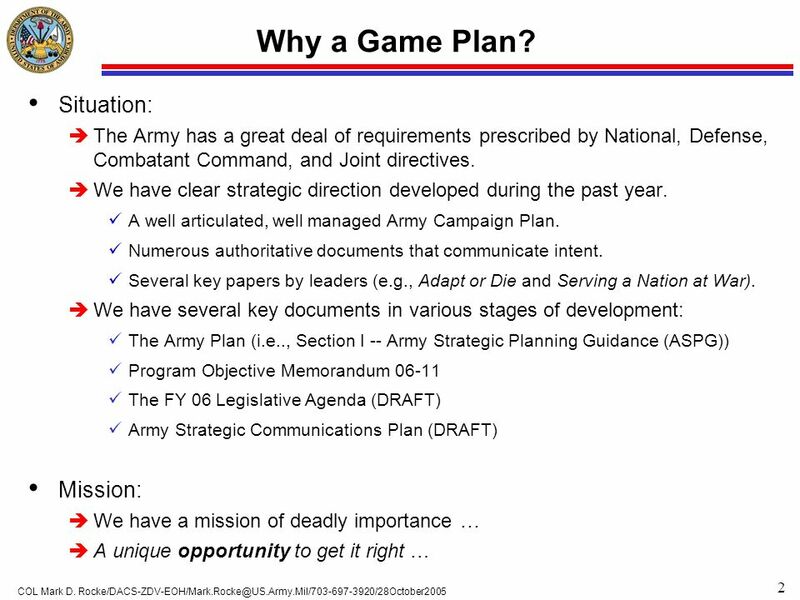 The Game Plan is intended to provide a common framework based on the integration of other key documents and plans that are in various stages of development The Army Strategic Planning Guidance, the FY ’06 Legislative Agenda, the Army Strategic Communications Plan, and the Army Posture Statement. During this past year, while establishing our strategic direction and waging war, we have developed tremendous momentum in our efforts. We have worked effectively to articulate our requirements; promote understanding of our needs; build support for our programs; attract and retain the highest quality volunteers; obtain the resources needed to achieve our objectives; while reinforcing the trust that the American people and our allies and partners have in our Army. We must, and we will, maintain this momentum as we move forward to build a campaign quality Army with the joint and expeditionary capabilities required by the Combatant Commanders today and tomorrow. This momentum will prove to be decisive in our collective efforts to achieve our overarching strategic goal, that applies to both today and tomorrow: The Army will remain relevant and ready by providing the Joint Force with essential capabilities to dominate across the full range of military operations. The Army will remain relevant to the challenges posed by the global security environment – across the range of military operations from irregular conflict to high intensity conventional warfare – and ready to provide the forces and capabilities required by the Combatant Commanders and the Joint Team. 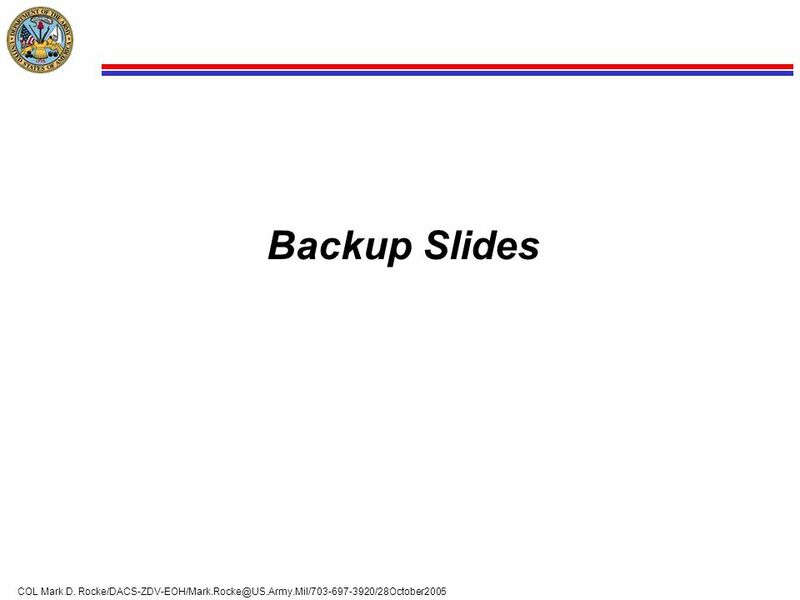 5 How Does the Game Plan Reinforce Key Strategic Documents? 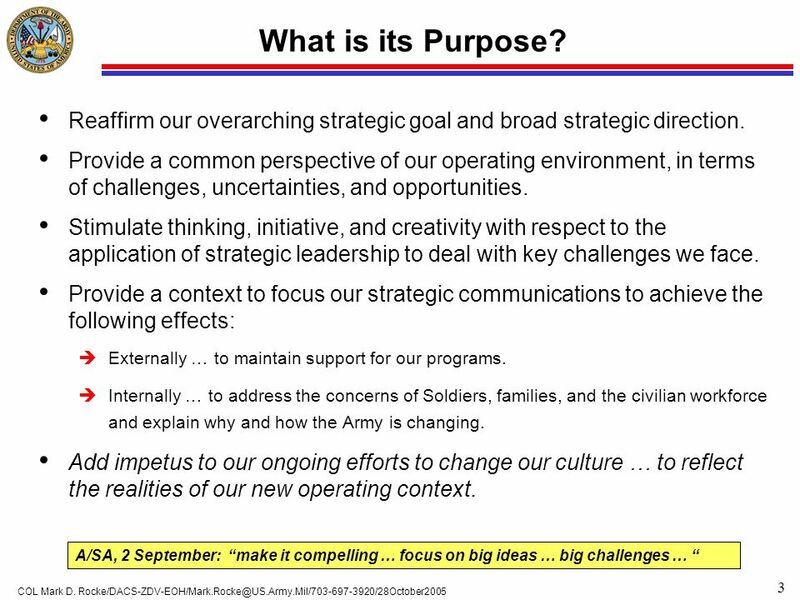 Army Strategic Planning Guidance (ASPG): Next Years Army Campaign Plan (ACP): Next 10 Years Game Plan: Next 1-2 Years FOCUS: CLARIFYING CURRENT AND FUTURE STRATEGIC CAPABILITIES FOCUS: TRANSFORMING TO CREATE A JOINT AND EXPEDITIONARY ARMY NOW FOCUS: REINFORCING INTENT, UNIFYING EFFORT, CLARIFYING LEADER ROLES … AND CHANGING CULTURE (SEIZING THE INITIATIVE TO EXPLOIT “WINDOW OF OPPORTUNITY.”) REINFORCING ASPG and ACP REAFFIRMS AND REINFORCES STRATEGIC DIRECTION AND MOMENTUM. HIGHLIGHTS PROGRESS TO DATE. 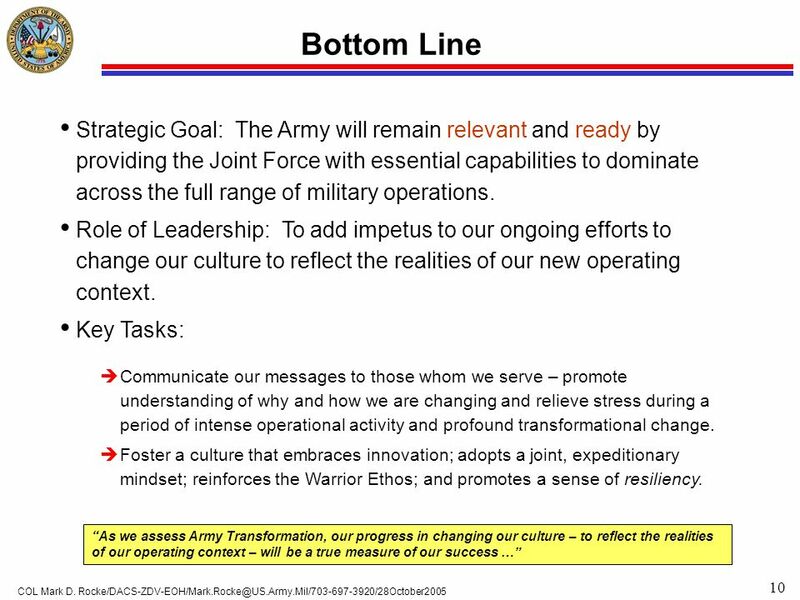 ARTICULATES STRATEGIC COMMUNICATIONS AND RESOURCING GOALS TO ENABLE: ACHIEVING OBJECTIVES OF THE ACP IN THE “WINDOW OF OPPORTUNITY.” ACHIEVING GOALS OF ASPG OVER LONGER TIME FRAME. PROMOTES BETTER UNDERSTANDING BY INTEGRATING NUMEROUS KEY STRATEGIC DOCUMENTS INTO ONE. 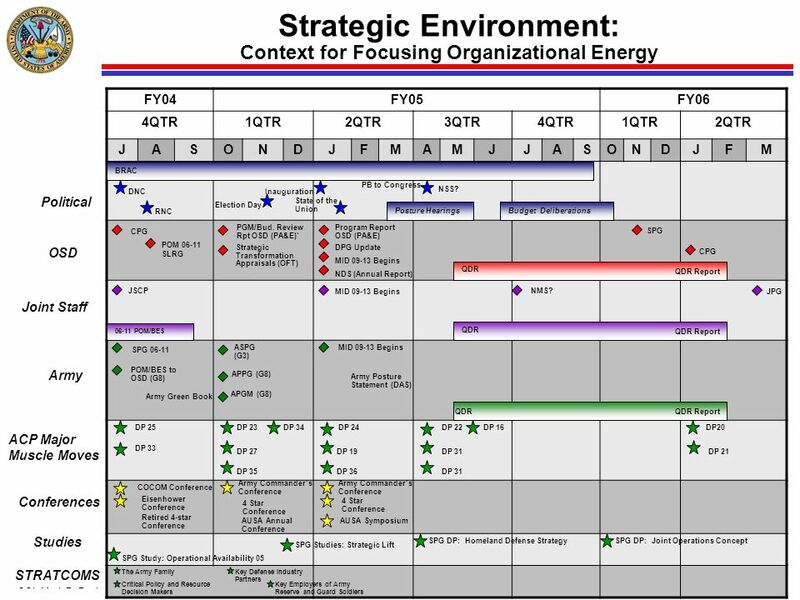 HIGHLIGHTS THE ROLE THAT LEADERS PLAY TO “LEAD CHANGE AND MANAGE COMPLEXITY.” The ASPG serves as the Army’s institutional strategy and as its principal planning document. The ASPG expresses the senior leadership’s intent for how the Army will fulfill its Title 10 obligations to the Joint Force and the Nation in support of the Defense and National Security strategies. The Game Plan underscores importance of ASPG; communicates to wider audience the foundational nature of ASPG. Emphasizes senior leader role in resourcing and strategy related processes; e.g., QDR and post-QDR strategy processes. The ACP directs planning, preparation, and execution of Army operations and Army transformation within the context of ongoing strategic commitments, including the Global War on Terrorism. Provides direction for detailed planning, preparation, and execution of a full range of tasks necessary to create and sustain a campaign capable joint and expeditionary Army. 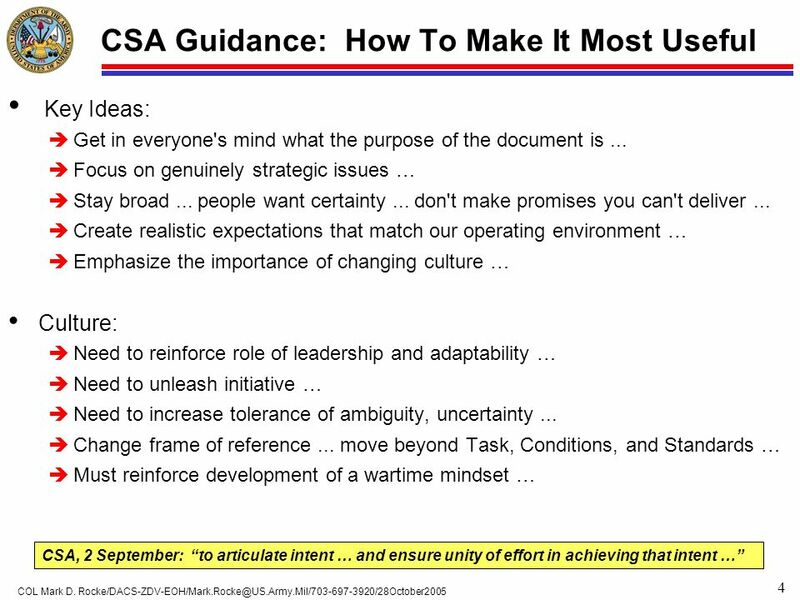 The Game Plan explains goals for culture under A/SA and CSA signature; amplifies ideas in ACP; e.g., Soldiers, All-Volunteer Force, Warrior Ethos, etc. ; structures and announces Institutional Army changes to achieve 30-plus objectives from ACP. 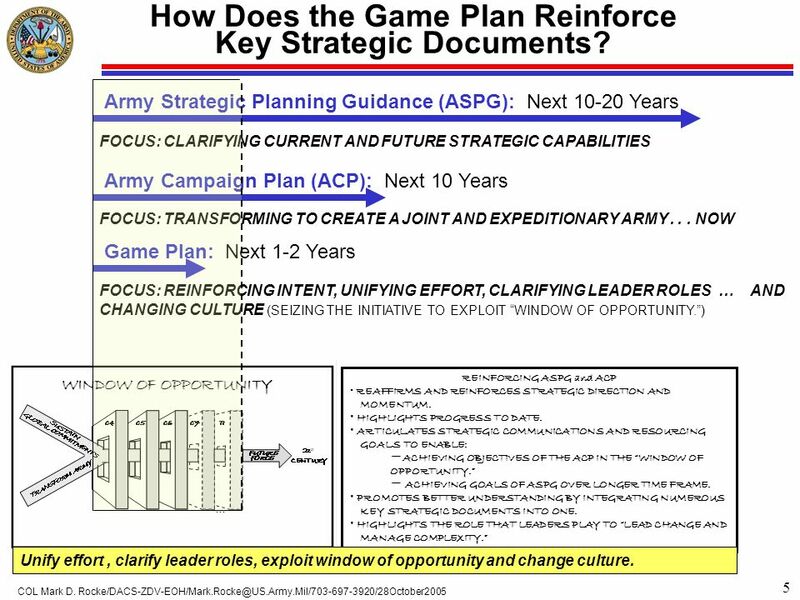 Summary: The Game Plan reinforces strategic direction and momentum; highlights progress to date; articulates strategic communications and resourcing goals to enable achieving objectives of ACP in “window of opportunity,” and goals of ASPG over longer time frame; integrates numerous documents into one to promote better understanding. Highlights the role that leaders play to “lead change and manage complexity.” Unify effort , clarify leader roles, exploit window of opportunity and change culture. A Persistent State of Conflict Will Endure The Army has an Unprecedented Window of Opportunity to Reshape the Force We Have Built Tremendous Momentum and Support for Our Programs We are Transforming Now – We are on the Right Course to Reshape the Force Strategic Goal: Relevant and Ready … Today and Tomorrow Intent: Seize the Initiative: Leadership Drives Change Reinforce Our Centerpiece: Soldiers as Warriors Maintain Viability of All-Volunteer Force Adapt the Institutional Army Change Army Culture to Reflect New Realities Resource the Force Tell the Army Story Effectively Articulate Strategic Rationale for Future Capabilities Reinforce Our Centerpiece: Slide 18 Soldiers as Warriors Foster “culture of engagement” Prepare people to tell the story Develop Strategic Communications, Command Information, and Congressional Engagement plans Informing the Nation is our obligation – a key responsibility Effective strategic engagement required to inform stakeholders “One Message—Many Voices” Critical outcomes: Recruit and Retain Quality Soldiers Maintain Public Support Resource the Army Tell the Army Story Effectively Sustained operations are our new norm – protracted conflict Must resource for today’s and tomorrow’s issues: Sustain Full Scope of Global Commitments (GWOT is a Subset) Transform the Army Enhance Well-being POM focus: Core Competencies Be able to discuss POM Articulate capabilities and needs Communicate need for balance Promote education and career progression opportunities Must leverage “window of opportunity” to change Resource the Force Must preserve viability Incorporating new manning concepts Rebalancing size and capabilities of components Must leverage contributions of civilian workforce Meet recruiting and retention goals Care for Soldiers, civilians, and families – and communicate well-being and installation enhancement programs Enhance safety programs Manage complexity; Lead change Maintain Viability of All-Volunteer Force Must embrace innovation Creating Joint and Expeditionary mindset Inculcating Warrior Ethos Building resiliency to uncertainty – to operate better in zones of discomfort Reinforce culture of innovation Understand joint, expeditionary implications today and tomorrow Reinforce all parts of Warrior Ethos (Creed and Values) Promote Soldier-family resiliency Change Army Culture to Reflect New Realities Must continue to emphasize Army contributions to Joint Team Create joint interdependence Leverage every potential tool Collaborate to develop Joint solutions See opportunities Build relationships Provide advice effectively Develop Joint Ops Concept Participate as senior leaders in assessments and studies Articulate Strategic Rationale for Future Capabilities Not business as usual; must support a Joint and expeditionary Army Must assess changes recommended in ACP Support needs of force Create culture of innovation Draft plan with clear vision Produce and begin to execute plan in FY 05 Understand essentiality of this critical task Counter resistance to change Develop institutional programs to influence innovation and cultural change Adapt the Institutional Army Assessment Leader Priorities Soldiers are the Army Our Nation is relying on Soldiers Supporting GWOT aggressively Soldier conduct must reflect Army Values (detainee abuse, larceny, and unsafe actions will alienate stakeholders) This section lays out the big ideas in the document in an expansible slide presentation. (Hyperlinks are embedded in the seven yellow blocks that represent the Leader Objectives. Clicking on these blocks will cause the Assessment and Leader Priorities to expand for ease of viewing.) The blocks that appear correspond to sections of the text. The Situation (first four gray blocks) is described on p. i of Game Plan. 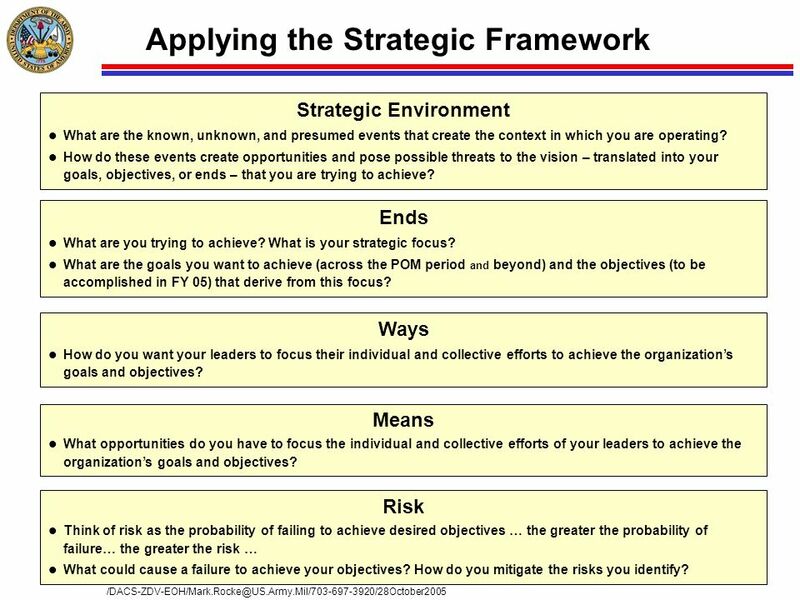 The Strategic Goal (Relevant and Ready Today and tomorrow) is described on p. 2 of Game Plan. The Intent (Seize the Initiative) is described on p. 3 of Game Plan. The Leader Objectives are explained on the following pages: Reinforce Our Centerpiece: Soldiers as Warriors - p. 5. 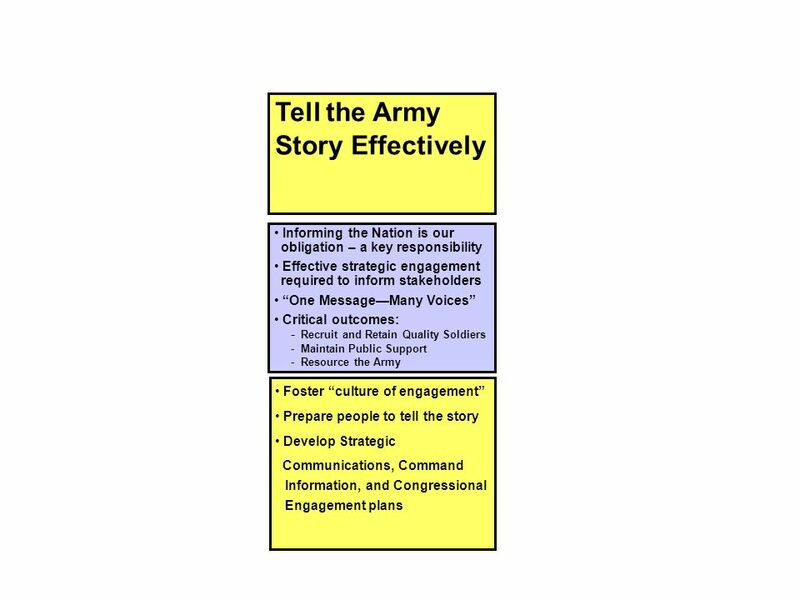 Tell the Army Story Effectively - p. 7. 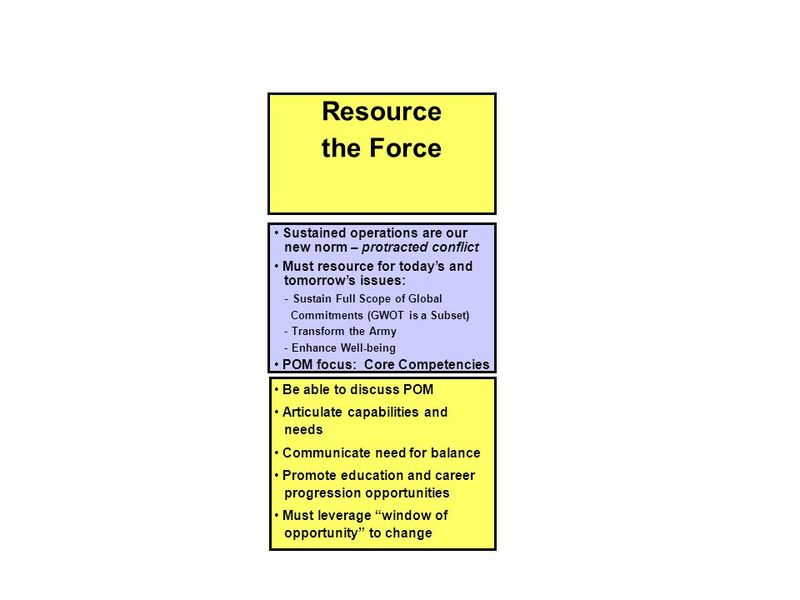 Resource the Force to Execute Our Strategic Requirements – p. 9. 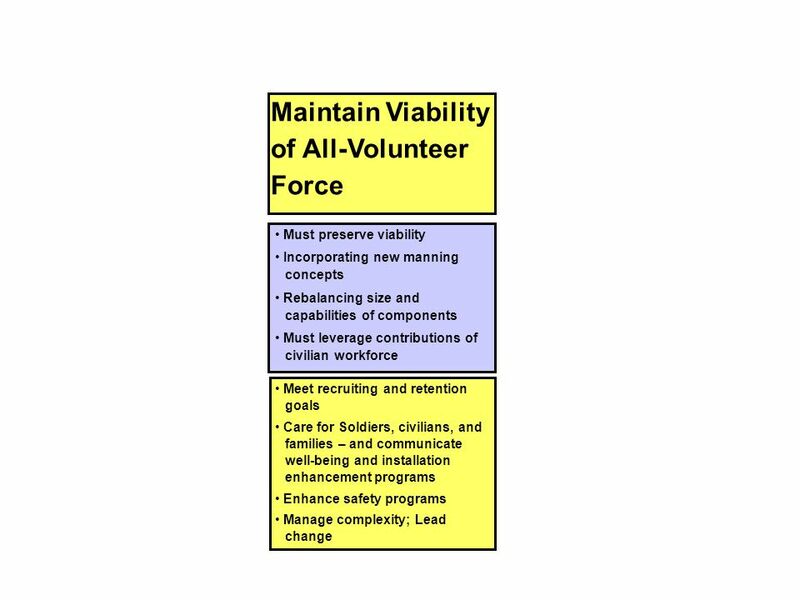 Maintain the Viability of the All-Volunteer Force – p. 11. 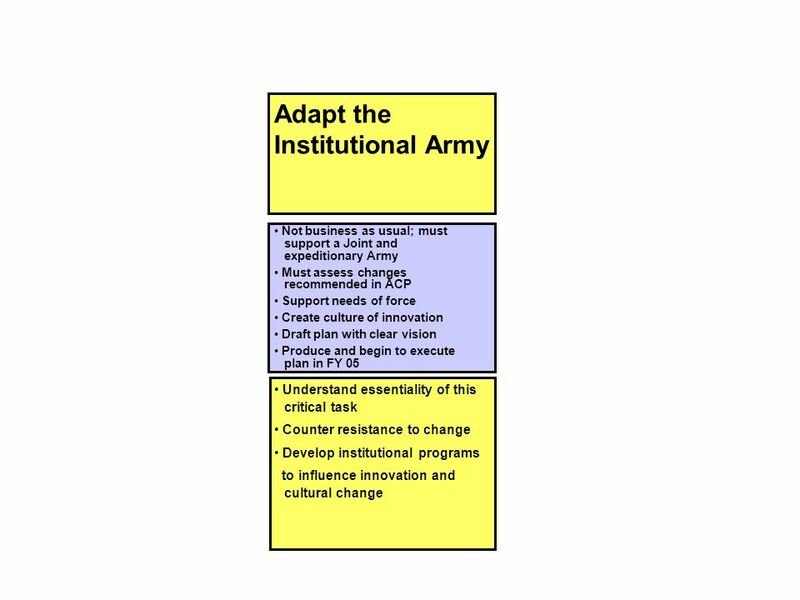 Change Army Culture to Reflect New Realities – p. 14. 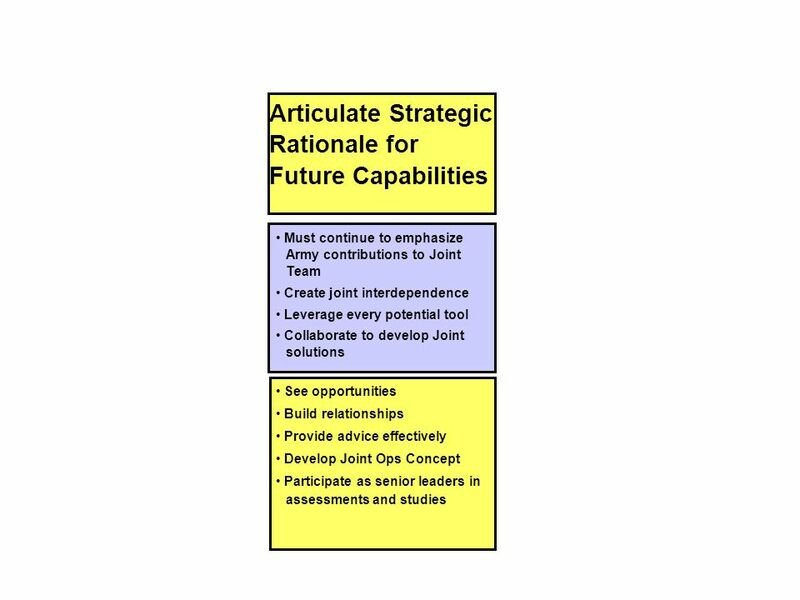 Articulate the Strategic Rationale for Joint and Service Future Capabilities – p. 17. Adapt the Institutional Army to Meet the Needs of the Emerging Operational Army – p. 19. Focusing Effort – p. 22. Managing Sources of Risk – p. 23. Creating the Future – p. 24. 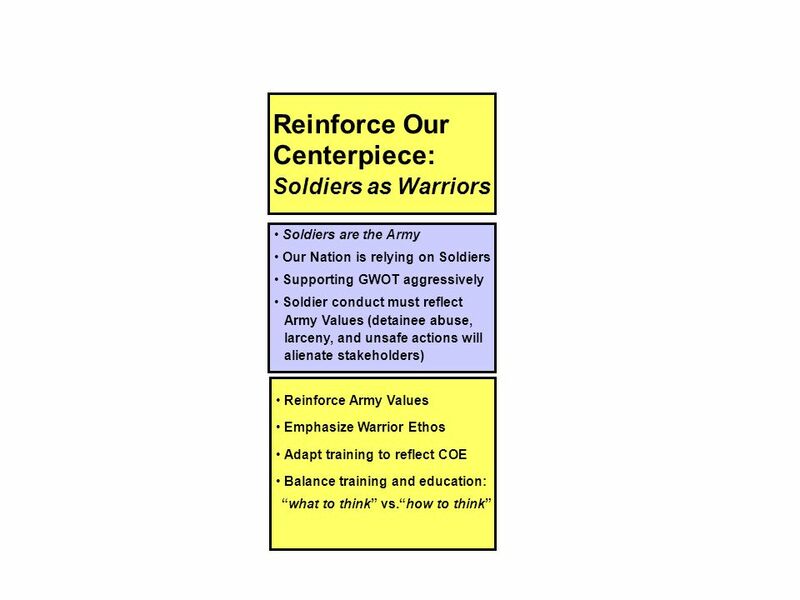 Reinforce Army Values Emphasize Warrior Ethos Adapt training to reflect COE Balance training and education: “what to think” vs.“how to think” Focusing Effort: - Amidst adversity, a range of opportunities is clearly evident. We must capitalize on these opportunities in the strategy development and resourcing processes. - Strengthen relationships and communication with other Services, Congress, the American public, and our primary customers: the Combatant Commanders and the Joint Team. 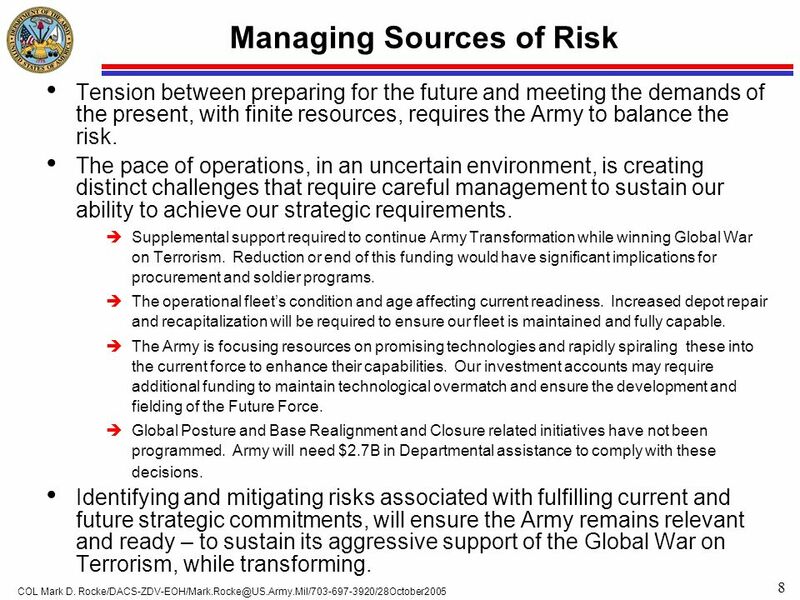 Managing Sources of Risk: - Risks do exist in this strategic environment, especially with regard to an uncooperative and adaptive enemy, finite resources, and our pace of operations. - Clearly, if we lose support for resourcing our programs, or must deploy organizations unexpectedly, we will have to adjust the path of our restructuring. 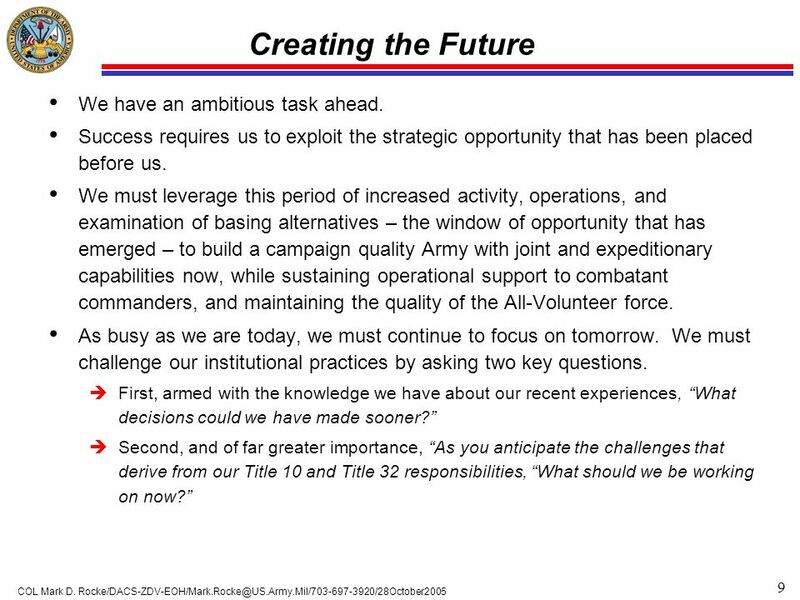 Creating the Future: Our Nation and our Army are engaged in a protracted Global War on Terrorism. How can we apply the lessons we have learned, at all levels, to improve performance? What decisions could we have made earlier? What should we be thinking about now? The Army will remain relevant and ready by providing the Joint Force with essential capabilities to dominate across the full range of military operations. Tension between preparing for the future and meeting the demands of the present, with finite resources, requires the Army to balance the risk. The pace of operations, in an uncertain environment, is creating distinct challenges that require careful management to sustain our ability to achieve our strategic requirements. Supplemental support required to continue Army Transformation while winning Global War on Terrorism. Reduction or end of this funding would have significant implications for procurement and soldier programs. The operational fleet’s condition and age affecting current readiness. Increased depot repair and recapitalization will be required to ensure our fleet is maintained and fully capable. The Army is focusing resources on promising technologies and rapidly spiraling these into the current force to enhance their capabilities. Our investment accounts may require additional funding to maintain technological overmatch and ensure the development and fielding of the Future Force. Global Posture and Base Realignment and Closure related initiatives have not been programmed. Army will need $2.7B in Departmental assistance to comply with these decisions. Identifying and mitigating risks associated with fulfilling current and future strategic commitments, will ensure the Army remains relevant and ready – to sustain its aggressive support of the Global War on Terrorism, while transforming. As the Army remains engaged, new challenges are emerging. The Army must prepare for future challenges, while meeting Combatant Commanders’ ground force needs. This tension between preparing for the future and meeting the demands of the present, with finite resources, requires the Army to balance risk. Our pace of operations, in an uncertain environment, is creating distinct challenges that require careful management to sustain our ability to achieve our strategic requirements. Increased resourcing is required to continue to transform and sustain the pool of all volunteer, brigade level Units of Action needed by the Joint Force to prevail in the Global War on Terrorism. The operational fleet’s condition and age is affecting current readiness. Our investment accounts may require additional funding to maintain technological overmatch and ensure the development and fielding of the Future Force. Global Posture and Base Realignment and Closure related initiatives have not been programmed. Identifying and mitigating the risks associated with fulfilling current and future strategic commitments will ensure the Army remains relevant and ready – to sustain its aggressive support of the Global War on Terrorism while transforming. 9 Creating the Future We have an ambitious task ahead. Success requires us to exploit the strategic opportunity that has been placed before us. 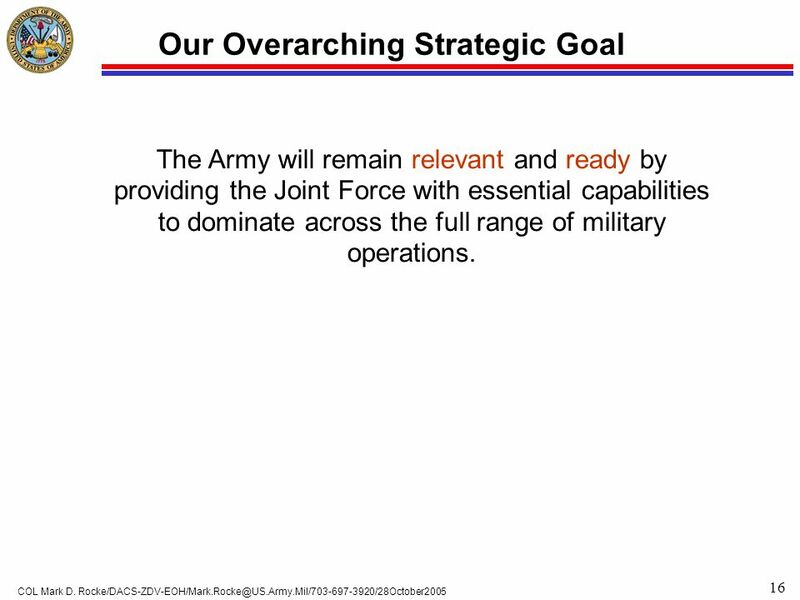 We must leverage this period of increased activity, operations, and examination of basing alternatives – the window of opportunity that has emerged – to build a campaign quality Army with joint and expeditionary capabilities now, while sustaining operational support to combatant commanders, and maintaining the quality of the All-Volunteer force. As busy as we are today, we must continue to focus on tomorrow. We must challenge our institutional practices by asking two key questions. First, armed with the knowledge we have about our recent experiences, “What decisions could we have made sooner?” Second, and of far greater importance, “As you anticipate the challenges that derive from our Title 10 and Title 32 responsibilities, “What should we be working on now?” Simply stated, we have an ambitious task. Success will require us to exploit the strategic opportunity that has been placed before us. Success will depend on our ability to objectively define and describe the capabilities we need to support the Combatant Commanders, other Services, and the Nation. We must leverage our wartime focus and increased resources – the window of opportunity that has emerged – to build a campaign quality Army with joint and expeditionary capabilities now, while sustaining operational support to combatant commanders, and maintaining the quality of the All-Volunteer Force. If we are successful in changing the behaviors, attitudes, and beliefs that combine to create our culture – and we maintain the continued support of our political leadership, our chain of command, and the American people – our collective focus and unity of effort will enable us to achieve our strategic goal, today and tomorrow. The Army will remain relevant and ready by providing the Joint Force with essential capabilities to dominate across the full range of military operations. Success for the Army in service to the Nation demands that we shape the future … that we anticipate it … and that we create it. What are the known, unknown, and presumed events that create the context in which you are operating? How do these events create opportunities and pose possible threats to the vision – translated into your goals, objectives, or ends – that you are trying to achieve? Ends What are you trying to achieve? What is your strategic focus? 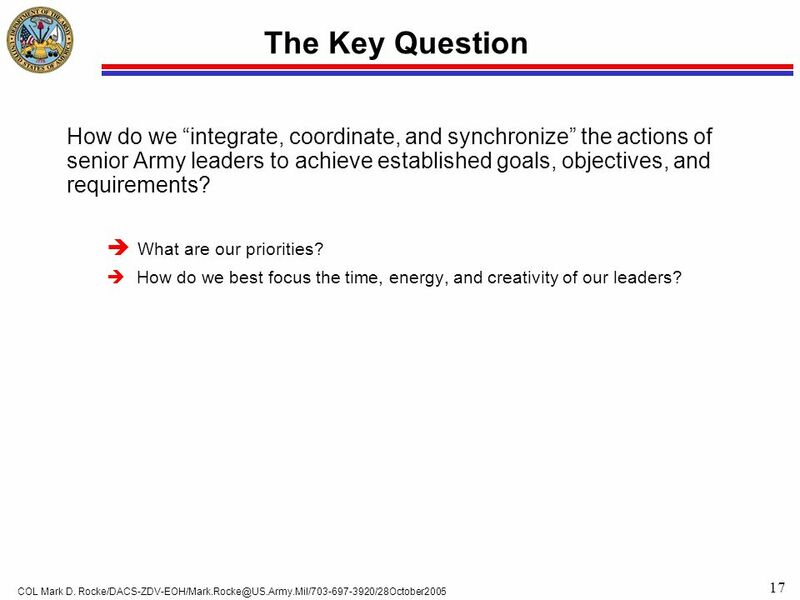 What are the goals you want to achieve (across the POM period and beyond) and the objectives (to be accomplished in FY 05) that derive from this focus? Ways How do you want your leaders to focus their individual and collective efforts to achieve the organization’s goals and objectives? This is the Framework used to solve the problem…it reflects a classic “E-E-W-M-R” approach. Means What opportunities do you have to focus the individual and collective efforts of your leaders to achieve the organization’s goals and objectives? Risk Think of risk as the probability of failing to achieve desired objectives … the greater the probability of failure… the greater the risk … What could cause a failure to achieve your objectives? How do you mitigate the risks you identify? 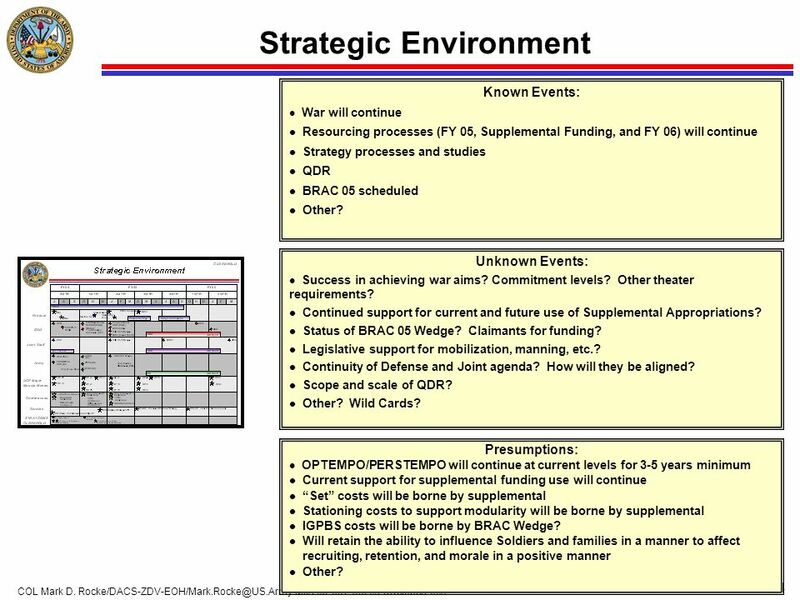 Known Events: War will continue Resourcing processes (FY 05, Supplemental Funding, and FY 06) will continue Strategy processes and studies QDR BRAC 05 scheduled Other? Unknown Events: Success in achieving war aims? Commitment levels? Other theater requirements? Continued support for current and future use of Supplemental Appropriations? Status of BRAC 05 Wedge? Claimants for funding? Legislative support for mobilization, manning, etc.? Continuity of Defense and Joint agenda? How will they be aligned? Scope and scale of QDR? Other? Wild Cards? Here is what we know, do not know and presume about the environment. We must test these presumptions, or assumptions, in a conscious way to mitigate risk… Presumptions: OPTEMPO/PERSTEMPO will continue at current levels for 3-5 years minimum Current support for supplemental funding use will continue “Set” costs will be borne by supplemental Stationing costs to support modularity will be borne by supplemental IGPBS costs will be borne by BRAC Wedge? Will retain the ability to influence Soldiers and families in a manner to affect recruiting, retention, and morale in a positive manner Other? The Army will remain relevant and ready by providing the Joint Force with essential capabilities to dominate across the full range of military operations. 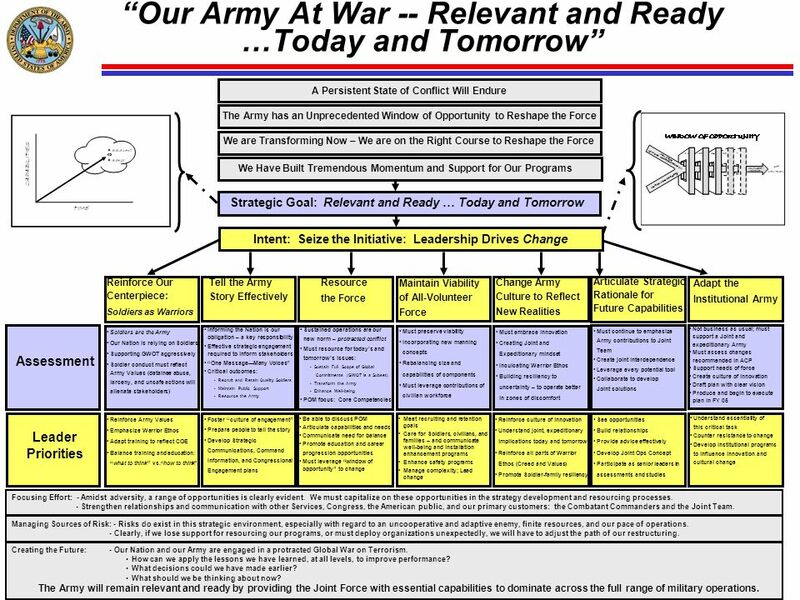 Download ppt "Our Army at War – Relevant and Ready…"
Leading for High Performance. PKR, Inc., for Cedar Rapids 10/04 2 Everythings Up-to-Date in Cedar Rapids! Working at classroom, building, and district. AFCEA DC Cyber Security Symposium Military Joint Cyber Command Panel Harry Raduege Lieutenant General, USAF (Ret) Chairman, Center for Network Innovation.